Starting at Aird, at the end of the Sleat road, this walk has it all: stunning scenery; a fantastic sandy beach; and the lighthouse at the Point itself which gives far reaching sea views and is a great vantage point for watching seabirds. This Skye coastal walking guide to the Point of Sleat outlines the route and what you may see on the walk. There’s good parking at Aird at the end of the public road from Armadale – just keep driving until the tarmac runs out. The views across the Sound of Sleat to the mainland hills will set the scene for the day. Go through the gate onto a track and follow it over the low hills for some way. At the prominent fork there’s the option of taking the left path which leads down to the beautiful and very secluded sandy bay below. The right fork is the one that leads onto the Point itself where the small automatic lighthouse provides a perfect picnic site with a panoramic view across to the mainland and out to the islands. This is great site for passing seabirds with Great Skua, Gannets, Guillemots, Razorbills and others passing the headland. 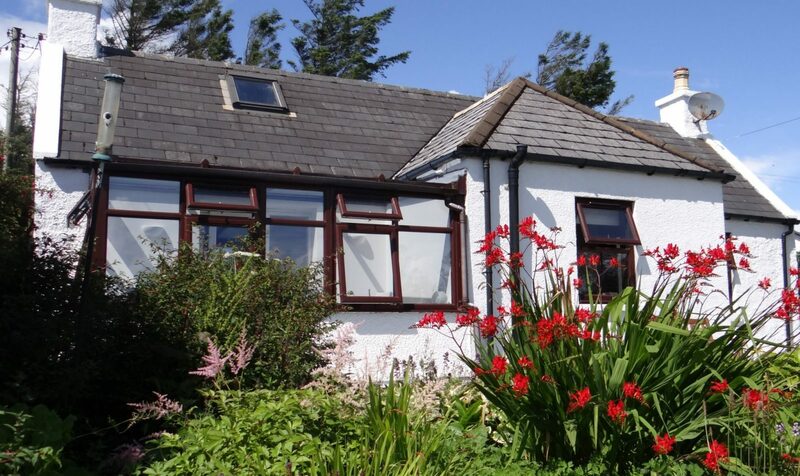 Guests staying at Springbank Elgol, our Skye self catering holiday cottage, have exclusive use of maps and guides that will help your exploration of this isolated spot. We also provide binoculars and a telescope, to help identify passing birds, and gear for rock pooling as part of our environmental activities offer. There’s plenty of rocky inlets to explore and, with a bit of scrambling, you can loop round the coast to the right and find the sheltered inlet where there a couple of houses. Alternatively, if you didn’t go to the beach on the way out, make sure you do on the way back as it is one of the best in Skye; don’t miss it! This entry was posted in Coastal Walking, Skye and tagged Bird watching, Birds, Elgol, Environmental Activities, Isle of Skye, Rock pooling, Sandy beach, Seabirds, self-catering holiday cottage, Skye, Sleat, Spingbank Cottage, walking, Wildlife by Matt. Bookmark the permalink.